otsoNY Comments: On January 23, 2014, it was announced that Robert Zemeckis would direct a film based on the story of Philippe Petit's walk between the Twin Towers of the World Trade Center in 1974. It was also confirmed that Zemeckis wanted Joseph Gordon-Levitt to star in the film as Petit. 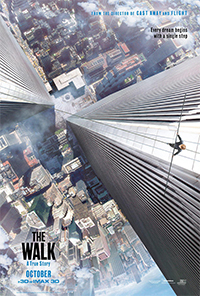 Principal photography began on May 26, 2014, in Montreal, and ended on August 6, 2014.
otsoNY Comments: Philippe Petit personally trained Gordon-Levitt how to walk on wire. He optimistically predicted that the actor would be able to walk on the wire alone after an elaborate workshop of eight days, which the actor did.Joseph Gordon-Levitt, who had no formal high-wire experience, trained directly with Philippe Petit. By the end of the eighth day, he was able to walk on the wire by himself, and continued to practice while shooting. Along with a stunt double, the actor shot the climactic wire-walking scenes on a soundstage; it had reconstructions of the top two stories of the tower and a wire approximately twelve feet off the ground, which was connected out across a green abyss and was anchored on a pole. otsoNY Comments: To learn more about what it was like, Gordon-Levitt also walked the distance between the World Trade Center memorial's two pools, which are located where the Twin Towers stood before the September 11 attacks. He visited the original observatory once before, in 2001, during his first summer in New York City. Aside from wire-walking, Gordon-Levitt also learned to speak French fluently, perfecting a Parisian accent aided by his co-star Charlotte Le Bon and other French actors on set.